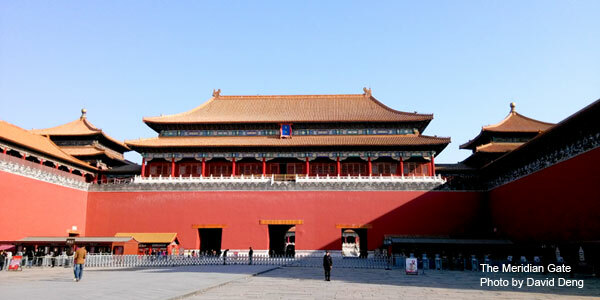 - visit 16 places in the Forbidden City, expert guide in Chinese culture and history, skip the line. This is our exclusive Forbidden City tour where we go deeply into the Chinese History with our Expert “Professor” Guide. We won’t miss any area that a common 2 hours tour does.You&apos;ll see mythical historic places with no rush at all, and getting the full picture with comprehensive explanations. 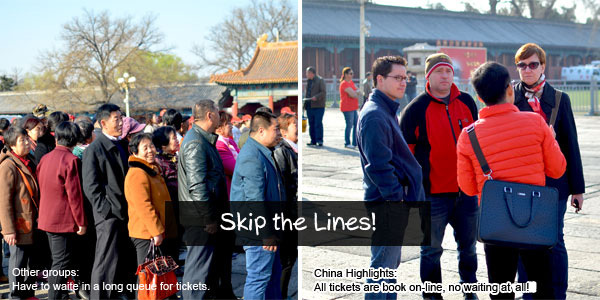 Skip the lines at the Forbidden City as China Highlights VIP guests. In this 600-year-old building complex with 9,999½ forbidden imperial chambers, today NOWHERE is closed and NO secret is kept from you. See the real scene of the movie The Last Emperor at the Forbidden City. Being amazed by the largest imperial palace (with 9,999½ palaces) in the world. 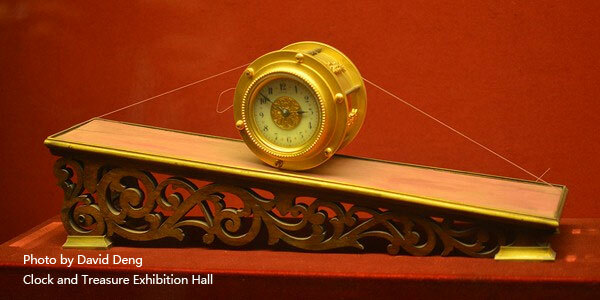 Discover the hidden history of Chinese imperial life. Skip the lines at the Forbidden City as a China Highlights’ VIP guest. Go deeply into the Chinese history with our Expert “Professor” Guide. See all the important places that a common 2 hours tour won&apos;t do with no rush at all. Enjoy a freshly-cooked Western lunch after the walking. 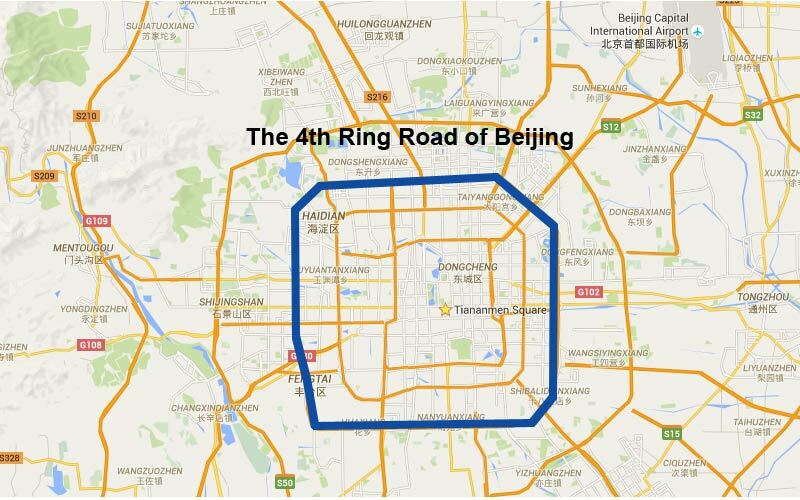 At about 8:00 am, a comfortable car will pick you up at your hotel and drive you to the Forbidden City. The Forbidden City is the largest imperial palace in the world, home to 24 emperors in the Ming (1368–1644) and Qing (1644–1911) Dynasties. It was built in 1420, about 70 years before Columbus discovered America and 144 years before the birth of William Shakespeare. You don&apos;t have to waste your time in waiting for the Forbidden City tickets like most of other tour groups do as your tour guide will book the tickets for you on-line in advance from the management office of the Forbidden City and this service is only opened for several registered partners of Forbidden City like China Highlights. We will provide the FM headset while your group consists of more than 3 people. Meet your Forbidden City presenter at the East Flower Gate for a brief introduction. 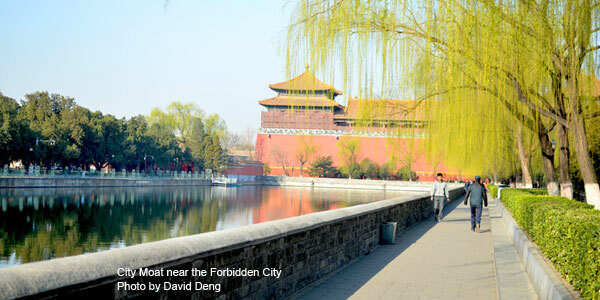 Stroll along the Forbidden City Moat and red outer wall to reach the Meridian Gate. Hear a brief introduction about the Meridian Gate, which is famous as a place to penalize offending officials in the Qing Dynasty. 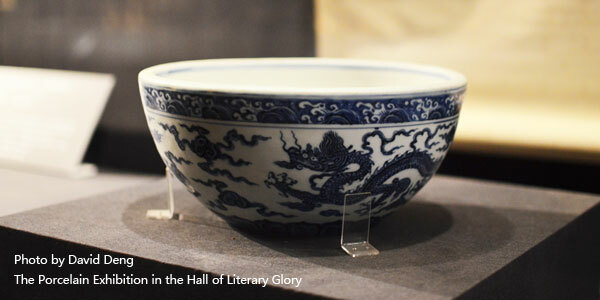 Turn right and enter the Hall of Literary Glory, which functions as the exhibition hall for porcelain at present. Your guide will present the procedure for making golden bricks, porcelains, and pillars on an iPad. Walk to the Hall of Literary Profundity, and view the royal library, built for the emperor 300 years ago. Back to the Central Axis Way, you will see a grand square in front of the Hall of Supreme Harmony. Your guide&apos;s presentation will answer your questions, like: Where is the throne of the Chinese emperors? How did the emperor have an audience with high-ranking officials? What is the significance of the sundial, bronze turtle statue, stork statue, huge copper vat, etc. Visit the Hall of Complete Harmony and Hall of Preserving Harmony, which respectively functioned as the place for the emperor to change his costume before grand ceremonies and the venue for the annual imperial exams. Walk along the white marble balustrade and descend from the main palaces. On the way you will see a high stone slab with a dragon and cloud design. It weighs about 200 tons. 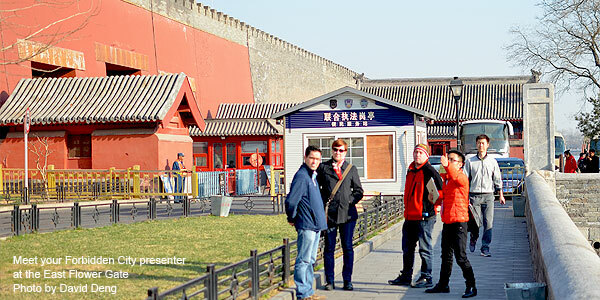 Our presenter will enlighten you as to how they were transferred into the Forbidden City. Walk to the eastern side of the Forbidden City to see the Clock and Treasure Exhibition Hall, and famous Nine Dragon Screen. Continue to walk deep into the second yard there, to see the Studio of Unimpeded Sound, where the Emperor and Empress watched the only entertainment in the imperial palace: Peking opera. 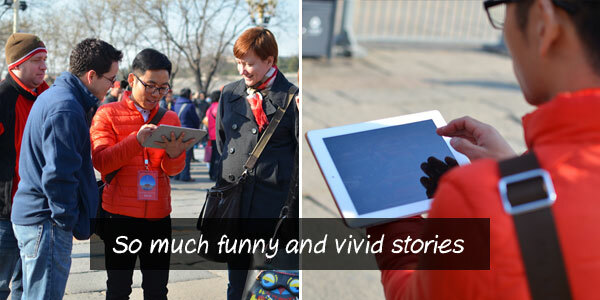 Your guide will brief you about Peking opera by showing iPad pictures. Walk along the red palace wall to the Palace of Prolonging Happiness to view remains of the most ingenious building in the Forbidden City — the Crystal Palace. Our iPad presentation will show you what it once looked like. Cross the Central Axis Way to view the Hall of Heavenly Purity and the Hall of Earthly Tranquility, which used to be respectively the audience hall for high ranking officials and the venue for emperors&apos; wedding ceremonies. Leaving the Inner Palace Courtyard, stroll along the side of the Western Chamber. Your next stop is the Hall of Mental Cultivation, where you can see the screen that was between the throne of "the Little Emperor" and his mother — "the Dragon Lady". It is where the renowned historical events known as "Power Behind the Screen" took place. Of course your guide will be giving elucidation, showing pictures and bringing back to clarity the life of those historical figures for you. 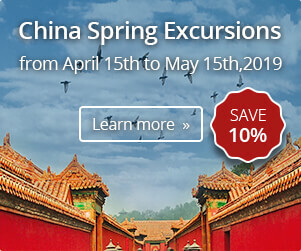 Visit the Palace of Eternal Spring, once the residence of the most influential political figure in late Qing Dynasty — the Dragon Lady, Empress Dowager Cixi. Though many experts criticized her about utilizing Chinese navy funding for building her own garden, which caused defeat in the war with Japan in 1898, she is also credited in the history of China as the benefactor of the first railway, first telegraph, first coalmine, and even first stock share. Your guide will show you her life on his iPad. Lastly you will be shown to the imperial garden and view the artificial rockery, surrounded by peonies and trees in beautiful shapes. Some of them looks like animals of the Chinese zodiac. The last palace you will see is called &apos;Feast Pavilion&apos;. In the Qing Dynasty the annual selection of the emperor&apos;s concubines happened there, and their story and that of the eunuchs will be presented. 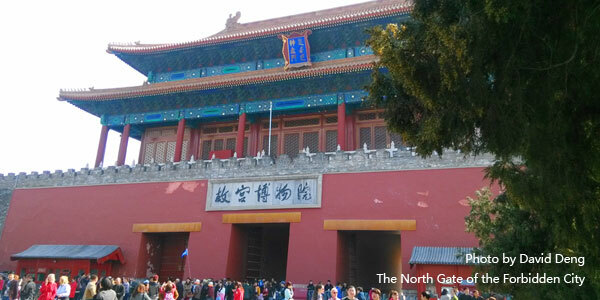 When exiting by the North Gate, you will cross the moat around the Forbidden City. The moat is 52 meters wide, and when its water frozen, people kept the ice in underground storehouses. When summer came, the ice was taken to the imperial palace to keep food and fruits fresh, and cool the air for the emperor and empress. If you want to know more about it, our guide will present pictures on the iPad. 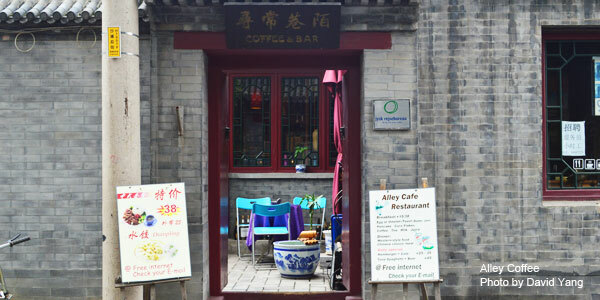 Your tour presenter will take you to a cafe (Alley Coffee) near the Forbidden City where you&apos;ll have your lunch there. 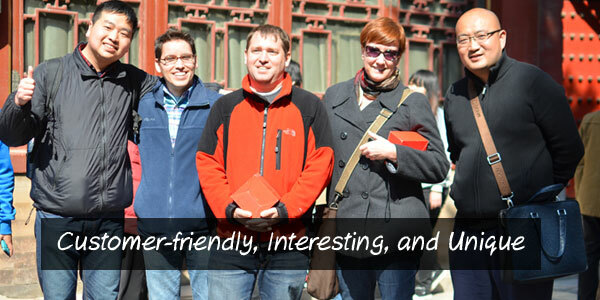 You can ask any questions about the Forbidden City, about the history and about Beijing. You presenter is more than happy to answer your questions. You can order the food in advance by leaving the message in the inquiry form so that you can save your time without waiting when you get to the restaurant. Choice A: Roast Chicken：one chicken Leg, French fires, Fresh vegetable salad. Beverage: Choose one in the drinks menu. Choice B: Boiled Dumpling: 16 Boiled dumplings, Cucumber, Soy sauce and Vinegar. 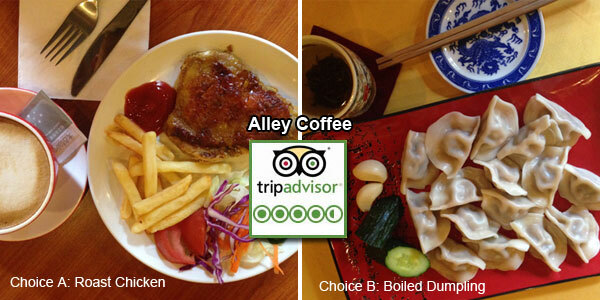 Beverage: Chinese Tea free refill or Choose a glass of Coke/Sprite, Orange/Apple Juice, hot/ice coffee. 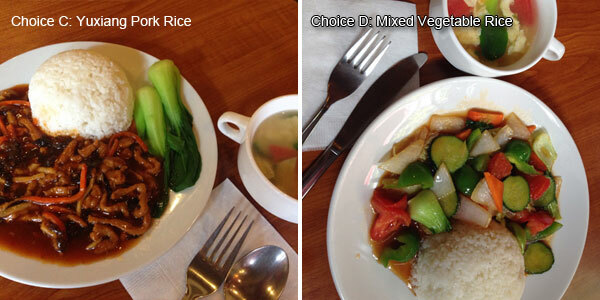 Choice C: Yuxiang Pork Rice: Yuxiang Pork, Rice, Chinese Soup and Vegetable. Beverage: Chinese Tea free refill or Choose a glass of Coke/Sprite,Orange/Apple Juice, hot/ice coffee. Choice D: Mixed Vegetable Rice: Fresh carrot, onion, tomato, pepper, cucumber, lettuce fried together, Rice and Chinese Soup. Beverage: Chinese Tea free refill or Choose a glass of Coke/Sprite,Orange/Apple Juice, hot/ice coffee. Choice E: Spaghetti: Pork sauce Italy noodle and Toast. Beverage: Choose a glass of Coke/Sprite, Orange/Apple Juice, hot/ice coffee, Tea. 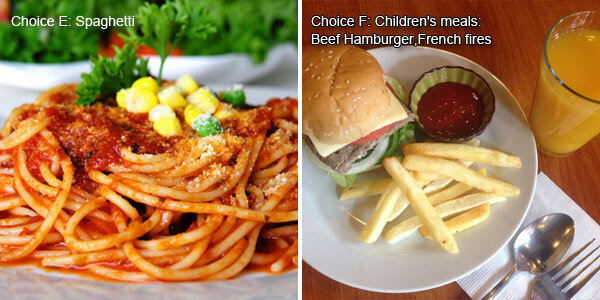 Choice F: Children&apos;s meals: Beef Hamburger,French fires. Beverage: Choose a glass of Coke/Sprite, Orange/Apple Juice. 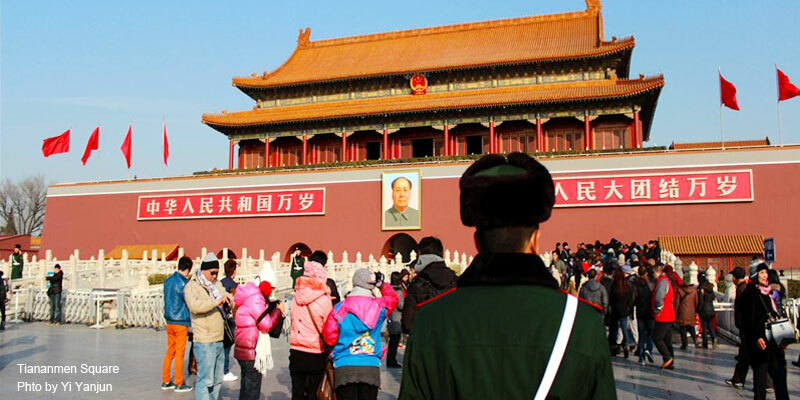 After the lunch, you will visit the Tian&apos;anmen Square - the largest urban square in the world where you can see the famous portrait of Chairman Mao hanging on the red wall. You can take pictures and walk around at the square. You guide will give you a background information of this famous square. Later on you will visit Jingshan Park which is located in front of the Forbidden City. It is said to be the best position to get a panoramic view of the Forbidden City. Definitely not to be missed, Jingshan Park is located on the central axis of Beijing and has many historic buildings symmetrically located on both sides. You will see the Drum and Bell Tower to the north while the Forbidden City and Tian&apos;anmen Square can be seen to the south. 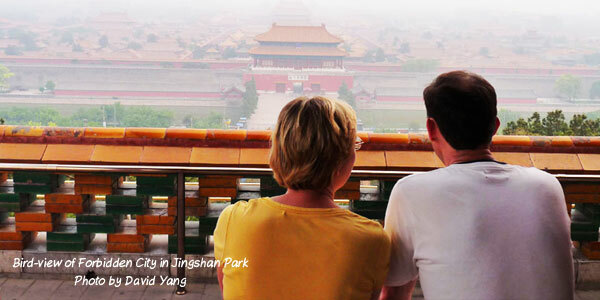 After visiting Jingshan Park you&apos;ll be transfered back to your hotel for the end of this day trip. Thanks for choosing China Highlights hope to serve you next time. This tour is available every Tuesday, Thursday, Saturday and Sunday except the following public holiday dates: 30/Dec/2017 - 01/Jan/2018, 15/Feb/2018 - 21/Feb/2018, 05/Apr/2018 - 07/Apr/2018, 29/Apr/2018 - 01/May/2018, 16/Jun/2018 - 18/Jun/2018, 22/Sep/2018 - 24/Sep/2018, 01/Oct/2018 - 07/Oct/2018. Entrance fees to the Forbidden City and Jingshan park. Lunch at a café near the Forbidden City. Gratuities to the tour guide & driver (usually CNY 60 - 100 per person per day for each of them, please tip them separately). It is not compulsory but would be a great encouragement for them. Get audio-visual insights into Chinese feudal society and emperors’ lives: 24 emperors, 14 in the Ming and 10 in the Qing Dynasty reigned over China from the Forbidden City. Discover the extravagance of Chinese royal architecture beneath the surface: timber from 100,000 Chinese cedars, 12 years making bricks, and 300 tons of gold leaf went into making almost 10,000 rooms for one man — the Chinese emperor! Learn how and when Chinese culture and customs came into being, and how they were passed on. 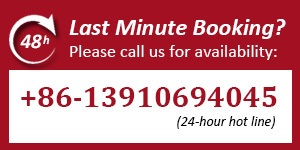 Instead of seeing a standard succession of similar rooms, and listening to textbook-like guide recitals, we attempt to bring imperial times to life for you through fascinating stories, anecdotes with original pictures, and videos shown on an iPad. Our Forbidden City presenters are tested and certified to our high standards in history and architecture knowledge and English. We try to bridge the gap between “old” and “new” China, and let you know how Chinese culture and customs came into being. For each Beijing local tour we design, our product manager and tour guides take many inspection trips to make sure our tours are more customer-friendly, interesting, and unique! We are very confident that our answers and information are reliable! We don’t, and even hate, the behavior of copying tour products from others. Text and pictures, even ideas, can be copied, but not the true value of years of preparation! You don&apos;t have to waste your precious time in waiting for the Forbidden City tickets like most of other tour groups do (usually you need to waite for about 1 hour!) 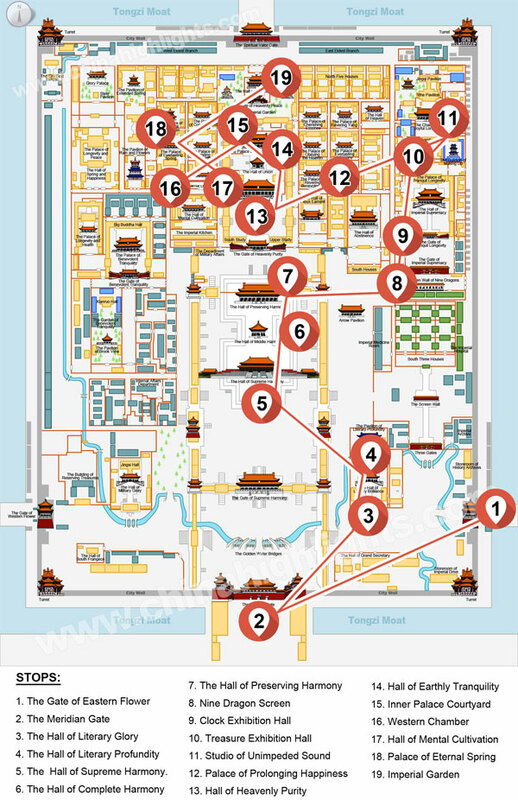 as your tour guide will book the tickets on-line for you in advance so that you can enter the Forbidden City directly while others are still waiting for the tickets and check-in. And this service is only offered to several registered partners of the Forbidden City like China Highlights. Unlike some other online travel agents in China who sell tour products made by local travel agents, we built our own branch company in Beijing in 2010. Since then we have started to make our own unique products and deliver our own brand of high-value tours to every one of our Beijing customers. We have more than 50 local staff in Beijing to solve your problems on the spot. Stroll along the Central Axis Way seeing similar palaces. See unique and interesting palaces you’d never find by yourself. 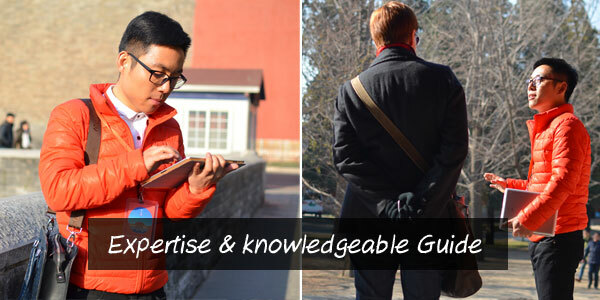 Listen to textbook recitals from the guide’s loud hailer. 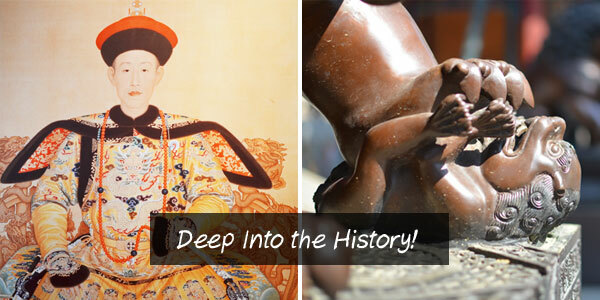 Discover the emperors’ life personally and intimately through fascinating stories, with original iPad pictures and videos. Try to find a spot where you can see and hear the guide amongst the noisy crowds. 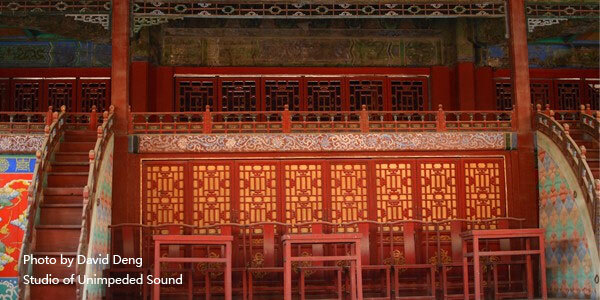 For our audio presentations, you’ll be staying away from noisy parts of the Forbidden City and hassle of other tour groups. Guide with government issued license. Extra-qualified expert and knowledgeable in history and architecture, certified to our higher standards of guiding. Have to stand in a long queue to get the tickets. Waste your time for the boring wating time. Skip the line, no waiting at all! Your tour guide has bought the tickets on-line in advance. 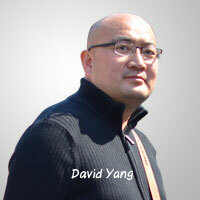 The Beijing Heritage Walk was founded in 2010 by David Yang. It aims to enhance the tour experience of the city’s ancient architecture and heritage sights, quite unlike the regular package group tour. David designed Heritage Walks to help you stay away from the noisy parts of regular tourist routes, recurring rooms, and run-of-the-mill replicated recitals. Instead, we believe the essence of Beijing hides in its people, its history, and its architecture, and it needs to be brought to life through insightful anecdotes illustrative pictures, and realistic videos, shown with the best-suited technology available (the iPad). Our expertise is the best way to unveil the face of this historic city for you, and we make every effort to create a meaningful and memorable experience for our customers. 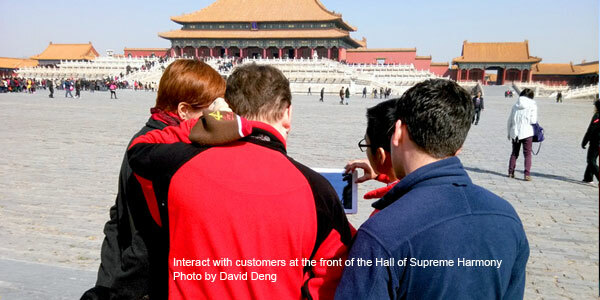 Working as a guide for 10 years, David found the Forbidden City is the "must" for his Beijing customers. But the regular tour groups, which only allocate 2 hours to the Forbidden City, just give a glimpse at six similar palace chambers, and miss most of the highlights due to time limitations. Customers constantly demanded to see more and enjoy more of the Forbidden City. So we reformed the experience to a 5-hour in-depth tour, with 13 stops at varied halls and museums, with different architectural styles and functions. Our guide presents the history of and anecdotes about those who once lived in Forbidden City on his iPad (not only emperors, but also those who lived around him, such as concubines and eunuchs). The unique highlights are comprehensive: the royal library, the only "half room” in the Forbidden City, the historic clock exhibition, the palace treasures exhibition, the Emperor&apos;s living room, the porcelain exhibition, the royal opera theater, etc.